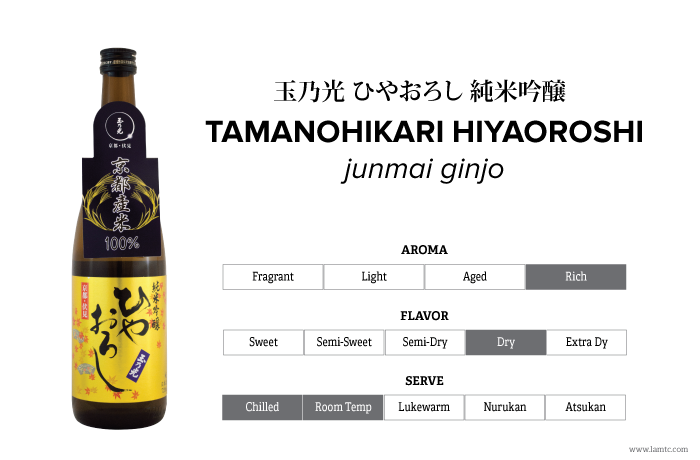 Hiyaoroshi Junmai Ginjo Hiyaoroshi from Tamanohikari Brewery is a scrumptious seasonal treat. Using 100% premium quality sake rice from Kyoto, Hiyaoroshi is aged in the coolest part of the brewery from the beginning of summer until the cooler fall season. Hiyaoroshi Junmai Ginjo is a beautiful essence of fall that adds perfect warmth and coziness. Available for a limited time only –enjoy it while you can! Brewery: Tamanohikari Sake Brewing Co., Ltd.